There are countless brands of carpet. You can even find companies trying to promote eco-carpet options. Whether you buy eco carpet, or standard carpet, the problems with carpet are universal and start immediately after you install it. Dirt. Stains. Wear paths. Constant vacuuming, and spot cleaning with chemicals. Even stain resistant carpet don't keep those qualities for long. Then, there are the chemicals in the carpet itself. Freshly laid carpet looks clean and bright. That is until you step on it. Then the constant maintenance begins. Nearly every type of carpet is produced using glues and adhesives that contain harmful chemicals such as formaldehyde and benzene. These chemicals needed to create the carpet itself should be major for anyone who is eco-friendly or suffering from respiratory issues. Good luck keeping your feet, pets, and everything else off of carpet. That’s the only way to maintain its color. Carpet can be installed in almost any interior application except a kitchen or bathroom. Generally should be avoided in commercial applications due to wear and abuse. Does not stand up to wear and abuse very well. Stains easily, holds odors, and traps dust, mites, and other organisms. Must be vacuumed routinely. A wet/dry or steam cleaning should be done at least twice a year. Carpet can not be refinished, only replaced. 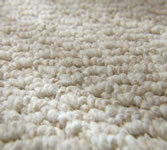 Carpet manufacturing has a negative impact on the environment. The use of toxic chemicals (formaldehyde, benzene and others) in glues and dyes are major concerns. They also emit odors and are themselves non-eco-friendly. 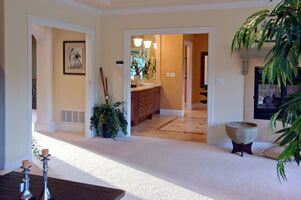 Carpet can add an extremely attractive look to your home. However, the look is short-lived as stains, snags and/or tears in the threading may necessitate replacement. Quality varies by manufacturer. There are many types of carpet. There’s a reason why more people replace carpet with other flooring options. When you add in that it is not eco-friendly and needs constant maintenance, eco-flooring might be a better choice for your 21st Century home or business.